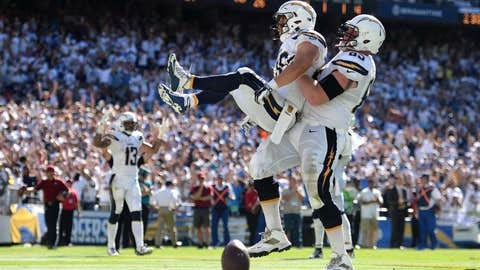 Sep 13, 2015; San Diego, CA, USA; San Diego Chargers running back Danny Woodhead (left) is lifted up by center Chris Watt (65) after scoring a fourth quarter touchdown against the Detroit Lions at Qualcomm Stadium. Last week, Philip Rivers led the San Diego Chargers to a 30-27 win over the Cleveland Browns, a performance good enough to win him AFC Offensive Player of the Week for the seventh time in his career. Now the Bolts look to put back-to-back victories together as they host the Pittsburgh Steelers on Monday Night Football. There are a lot of storylines heading into this game, with most of them centered around injuries for both teams. The Chargers’ offensive line has been banged up for almost the whole season, and have depended on a lot of versatile guys to keep them afloat so far. Perhaps the biggest story for the Bolts though is the return of Antonio Gates after serving a four-game PED suspension. Gates needs one touchdown catch to reach 100 for his Hall of Fame-caliber career. On the Steelers’ end, Ben Roethlisberger is sidelined with a knee injury and Michael Vick has stepped in since Week 2. Since Big Ben’s injury, the Steelers’ passing game has been on the downside, but they look to step it up on Monday night against the Chargers. The Steelers will also start rookie kicker Chris Boswell, just a week after they cut ties with Josh Scobee for his shaky performance in their loss to the Ravens. Brie Thiele made another round at the Chargers’ tailgate last Sunday, this time going in depth with "Bolt Pride," a group dedicated to keeping the Chargers in San Diego. In what felt like moments after the final out of the Padres’ 2015 season, the team ousted interim manager Pat Murphy and began the search for its new full time manager. AJ Preller spoke to the media earlier in the week, discussing what he’s looking for in the next manager of the Friars. The last guest on #SDLive this season was Padres’ ace James Shields. Shields talked with Mike Pomeranz about his offseason plans, and also played a game of "Who and Why", answering some funny questions about his teammates. What do Giants, Mariners, Brewers, Angels and Padres fans all have in common? Not all of them have the most diehard fans with the most knowledge. In a "best of" version of "How Well Do You Know Your Team? ", Mark Grant tests the knowledge of fans about their favorite teams. Despite a fourth place finish in the NL West, the San Diego Padres ratings were up 22% on FOX Sports San Diego in 2015. So from all of us at the network, thanks for watching! Even the shot clock isn’t safe. From the looks of this video, it appears this might be a normal thing in Alaska, but hey, sometimes you just got to stand your ground, regardless of your species. Nick Hardwick has shown us his agility throughout his career on the playing the field, but this year he’s gone above and beyond with the beginning of his broadcasting career. As the host of "Behind the Bolt with Nick Hardwick," and reporting from the sidelines during radio broadcasts, Nick has even shown us he can do a good Jon Gruden impression.